★PORTABLE FOR TRAVEL&EXHIBITION:No more tangled jewelry with this jewelry case, this holder keeps your daily jewelry or Participate in exhibition jewelry organized and can be placed in trunk or luggage; great for long holiday, weekends away, business trip. ★QUALITY MATERIAL&EXQUISITE CRAFTSMANSHIP:Deluxe PU Leather,best velvet lining (Claimond veins),Durable zipper head.Made by hand with precision, we make sure every compartment is aligned and the velvet materials stretched so that there are no bumps.Our traditional handicraftmen is strict with all details of our products. ★EXTENSIVE USE & GREAT GIFT IDEA: Not only for everyday use or shop display, this jewelry box can also be a perfect travel companion. Your beloved would not be happier when receiving such a nice gift on Valentine's Day, Christmas, New Year, Birthday, Wedding and so on.It's also a premium gift for your mother, girlfriend, wife, daughter, colleague, friend or any other special woman in your life. ★NOTE:BEST CUSTOMER SERVICE FOR YOU-Provided no accident likes stains or cuts on your part, we are ready to replace a defective product. 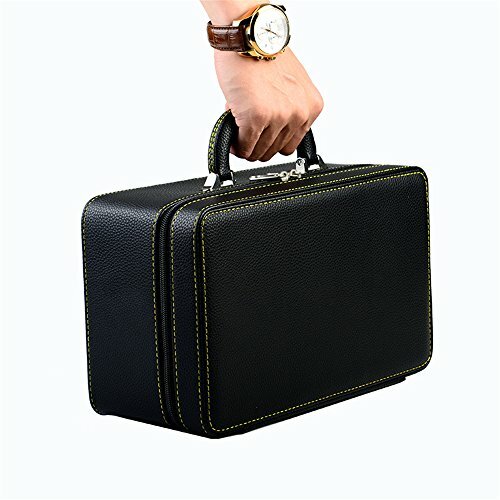 No time limit, no questions asked.Simply return the product to receive a replacement or a full refund!BUYING DIRECTLY FROM THE MANUFACTUER-We are specialized in hand-made jewelry Case.Don't hesitate.You are buying directly from the MANUFACTUER!